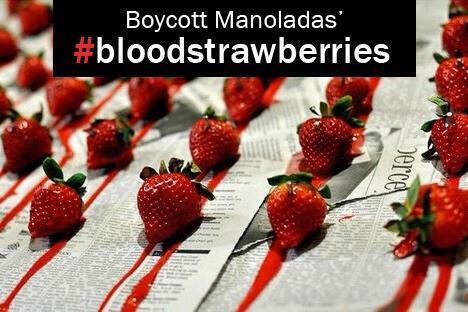 This image was widely used in a campaign to boycott Manolada strawberries, circulated in social media after the shootings in 2013. It was April of 2013, when Greece and the international press were shocked by the news that about thirty migrant workers were shot by the supervisors of the strawberry fields where they had been working in Manolada, Peloponese, after asking for six months’ worth of unpaid wages. More than a year later, at the end of July 2014, the trial of the four farmers involved concluded. Two of them, including the owner of the farm, also charged for human trafficking, were acquitted; two were found guilty of serious bodily harm and abetting serious bodily harm from neglect and received sentences of fourteen years and seven months and eight years and seven months respectively, but were freed pending appeal. In other words, no one is being punished for the shooting of twenty-eight people. The failure of the Greek judiciary system to provide justice for the Bangladeshi immigrants is reflective of the general failure of the Greek state to protect migrant workers, who have been subjected to inhuman living and working conditions over the years. A lot of them desperate and undocumented are easy prey to the greediness of farmers. Anecdotes of undocumented immigrants being exploited over harvest period and later dismissed with threats and unpaid have been common knowledge for decades. The area of Nea Manolada has a recorded history of abuse of immigrants. A report by Amnesty International in the aftermath of last year’s shootings revealed the extent of labour exploitation endured by the strawberry pickers. More than a year later, nothing has improved. On the contrary, July’s verdict ultimately condoned modern slavery and gave a free pass to Greek farmers to pursue their profits at any human cost. Police and migrants during the operation “Xenios Zeus”. This abuse of migrant workers should be addressed within the context of broader state policies with regard to migrants. Great numbers of immigrants and asylum seekers are being indiscriminately kept at detention centres, often indefinitely, under conditions that have been recently described by Médecins Sans Frontières as deplorable and dangerous for the migrants’ health. Many of these detention centres were created out of disused military sites in 2012, with the launch of a plan to round up undocumented immigrants, which has been shamelessly named Operation Xenius Zeus, after the ancient Greek god of hospitality. For the conservative-dominated coalition this measure has been described as necessary in order to secure the borders, and improve the living standards by reducing crime in the capital. For the public, there is – at best – a general “out of sight, out of mind” attitude towards the living conditions of migrants in the detention centres. Both approaches adopt a discourse of victimization, where Greece is seen as suffering the consequences of EU immigration policies, while ultimately reproducing ideas more suitable to the supporters of Golden Dawn, the ultra-right party, whose leadership is being currently prosecuted for criminal activities. The result of these practices of migrant abuse, in farms and detention centres, is the systematic dehumanization of immigrants, who are devoid of basic rights in their everyday life but also of any kind of voice or representation in the public sphere. The plight of migrants and refugees in Greece is well documented in international media. Such a discussion is largely absent from the Greek media. The news of the Manolada verdict was not met with a public outrage equivalent to the shock the news of the shooting had caused more than a year earlier. It did not even make front page in the mainstream press, apart from very few exceptions. At the same time, its reporting was framed across political lines, as if the issue is another battlefield of party politics rather than of concern to the entirety of Greek society, and with no statement from the scores of migrant workers who had gathered outside the court and staged a sit-in after the verdict was announced. As long as migrants remain invisible, however, they are easier to ignore or abuse. As the Supreme Court is to review the court decision, after its prosecutor asked for a copy of the verdict as soon as it is published, there is a chance that the initial, unanimous judgment is overturned. In the meantime, however, the Manolada verdict is another brick in the wall of the purgatory Greece has become for immigrants, and of the anti-immigration rhetoric explicitly preached by the growing far-right but ultimately deeply infiltrating Greek society. Maria Kyriakidou is a Lecturer in Cultural Politics, Communications and Media at the University of East Anglia. Her work focuses on the mediation of distant suffering, the role of representation in globalisation, cosmopolitanism and discourse theory. She is also interested in the way media discourses on the Euro Crisis construct and reproduce national stereotypes and divisive lines among the European counterparts. She holds a PhD in Media and Communications from the LSE and is an Associate to the Southern Europe International Affairs Programme of LSE IDEAS . View all posts by Maria, follow her on Twitter@Maria_Kyriakid or visit her profile on academia.edu. This entry was posted in Greece, Maria Kyriakidou and tagged Golden Dawn, Greece, human rights, immigration, Manolada, migrants, strawberries, Zeus Xenios. Bookmark the permalink. One Response to In Greece, They Shoot Immigrants, Don’t They?